Do you want the most comfortable lounge chair you’ll ever experience? Then choose a zero gravity recliner for your patio or porch. The name comes from the way the chair reclines similar to an astronaut’s seat. The backrest leans back to at least 130 degrees while the knees remain slightly bent. As a result, this position provides relief for a sore back. Let’s look at the best zero gravity chairs to see why they are gaining in popularity. Timber Ridge makes attractive padded recliners that outshine the competition on several points. For example, although the padding will soak up the rain, it’s comfy. Other zero gravity chairs often use Textilene mesh that’s breathable, but bare-bones. Next, the Timber Ridge chair has dimensions that appeal to American standards for comfort. It holds up to 350 pounds. Plus it has a 21-inch width. And it measures over 70-inches long when fully reclined. Compare those specs to the numbers posted by other manufacturers, and you’ll see that this chair is roomy. Finally, there are a few other features you’ll enjoy. The first is that it comes with ergonomic wooden armrests and a cup holder. Moreover, the headrest adjusts downward to support your lower back if you like. Plus, the manufacturer offers a 1-year warranty. PHI VILLA’s padded zero gravity lounger goes head-to-head with the one from Timber Ridge. It holds up to 350 pounds and stretches out to 65 inches long. The Oxford fabric is pleasant all year round. And the wooden armrests stay cooler than black plastic in the hot sun. The best parts of the PHI VILLA chair are the cup holder tray and the 29-inch width. But it also comes with an adjustable headrest. Like other zero gravity recliners, it folds up for storage or transport to events. LUCKYBERRY appears to be a twin to the PHI VILLA oversized padded recliner above. It measures 65 inches long when it’s reclined to the maximum 170-degree angle. It has a lever lock underneath each armrest. And it supports up to 350 pounds. The chair from Akari Decor comes with both an accessory tray and a canopy. Although the canopy is small, it throws enough shade to see your screen or keep the sun out of your eyes. Moreover, it adjusts or folds down behind the chair when it’s not needed. The accessory tray has spaces for two drinks plus other small items. It stays level when you recline or pops off when you fold up the chair. The 21-inch wide body of the recliner is made of UV-resistant Texteline mesh. It dries quickly and allows air to circulate to keep you cool. It’s also easy to wipe clean. 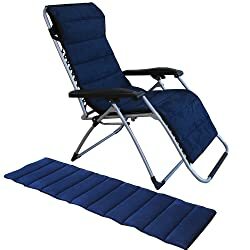 One of the least expensive zero gravity chairs is the Infinity from Caravan Sports. But it offers a lot of value if you don’t want one with big and tall dimensions. It supports up to 300 pounds and has a 20-inch wide seat. When it’s fully reclined, it measures about 64.5 inches long. But if you’re shopping for a zero-gravity lounger to bring to the beach or the park, this one only weighs 18 pounds. Additionally, it folds down to a compact 6.3-inch thickness. Since it’s made of Texteline mesh, it’s easy to clean and resists fading in the sunlight. It’s also available in several colors. Is it worth it to pay a little more for an “oversized” chair? Let’s look at this one from Caravan Sports and compare it to the base model above. For one, the oversized recliner holds thirty pounds more weight. Just as important, the seat is 4 inches wider. But the length is exactly the same, leaving taller users with their feet hanging over the bottom bar. In conclusion, if you want more room and aren’t over 6-feet tall, this is a good option. 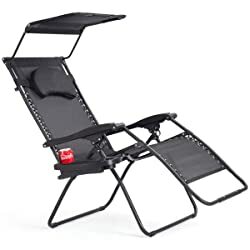 Even AmazonBasics has their own zero gravity chair now. How does it stack up to the others we reviewed? First, its specifications are typical of other recliners in the same class. It holds up to 300 pounds, and it’s 25.5 inches wide (including the armrests). Also, the body is Textilene suspended on a double bungee cord system. Of course, you can buy it in more than one color. The weak point is the knob recline locking system. Customers complain that it’s difficult to use and doesn’t always lock the chair into position. Other chair brands have moved to lever or ring locking systems to alleviate those problems. But the benefit of buying AmazonBasics is that the chair comes with a 1-year warranty. Best Choice Products sells an all-in-one solution for your patio. It’s a zero gravity chair with sunshade and cup holder tray. But it’s small for customers who want more room to lounge. That’s because it has a weight limit of 250 pounds and a 61-inch length when fully open. Worse, the width is only 19 inches. On the other hand, the chair comes in a variety of colors. Furthermore, it has the improved lever lock system to manage the reclining position. If you don’t love plastic mesh chairs, try the padded suede cushion on the Le Papillon chair. It’s plush and comfortable even for winter campouts. And should you place the recliner by the pool, just remove the cushion, and you’re left with the Texteline body and pillow headrest. The chair supports up to 330 pounds. It has a tabbed locking system, a 20.5-inch seat width, and protective feet on the frame. Le Papillon isn’t the only company to catch onto the idea of adding a luxurious cushion to their zero gravity chair. The Four Seasons recliner has one too. Best of all, you can remove and machine-wash this thickly padded wonder. The basic structure of the chair looks like Textilene mesh. It supports up to 330 pounds, but it has sturdy rectangular tubes for the frame, not round ones like most other models. It also lets you set any one of 40 recline positions between 90 and 166 degrees with its finger-ring lock. Super Decor sells a matching pair of zero gravity chairs complete with canopies and cup holders. Each recliner is 65 inches long by 25.2 inches wide (including the armrests). Additionally, each one supports up to 300 pounds. Abba Patio describes their Texteline zero gravity chair as oversized because it’s 29.13 inches wide (including the frame) and holds up to 330 pounds. It sports the finger ring recline locking system that’s easier to use than the earlier generation knobs. And it comes with a canopy sunshade plus a clip-on drink holder. The Goplus recliner offers the comfort of a canopy and a cup holder tray. It’s quite similar to the Caravan Sports chair in that it supports up to 250 pounds but weighs only 18.5 pounds total. One thing that Goplus reveals is the size of their canopy. It’s 24 inches long by 15.5 inches wide. That gives you an idea of how it can shade your head and shoulders or your reading material from the glare of the sun. The PHI VILLA lounge chair has a canopy that blocks up to 80% of UV radiation from the sun. It’s too bad that it only covers a portion of your body when you recline. This recliner holds up to 300 pounds. It features ergonomic armrests and Textilene fabric on a bungee cord suspension structure. Why spend time on an ordinary chair or sofa when you can enjoy maximum pain relief in a zero gravity recliner? This one from Svago offers both heat and massage functions. It also has removable lumbar support and headrest. Cozzia’s plush power recliner slips you back in zero gravity position with the touch of a button. Then it kneads away stress with vibration massage and heat therapy. The Human Touch Novo XT zero gravity chair is like nothing else on this earth. It doesn’t just vibrate away aches; it performs an actual massage on your sore spots. Choose from three deep-tissue massages with five levels of intensity. It even rubs your feet and lets you listen to your favorite music. The chair is so good that it’s recommended by the World Federation of Chiropractic. It suits users from 5’ to 6’9” tall. In addition, it supports up to 300 pounds. The Novo XT comes fully assembled and ready to enjoy. It’s covered by a 5-year warranty with in-home labor. 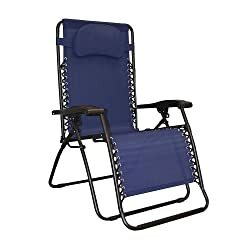 The reclined position of a zero gravity chair greatly reduces stress on your spine and legs. Astronauts use it to spread the g-force pressure they face upon takeoff from Earth into space. Therefore, reclining with your legs up (but not prone) is quite comfortable planetside, too. Elevating the legs also benefits circulation. And people who’ve experienced a massage in a zero gravity chair say that it’s intense and incomparable. If you suffer from lower back pain or swollen feet, a zero gravity chair might be just what you need to relax. There is a wide variety of zero gravity chairs available right now. You can find ones for your porch and patio as well as your living room. Many users find them much more pleasant than a typical lawn chair. As you shop, notice features like the size, the weight limit, and the material. Then you’re sure to find the perfect zero gravity recliner for your needs.